Like its vinegar counterpart, hot apple cider has its selling points and its shortcomings. 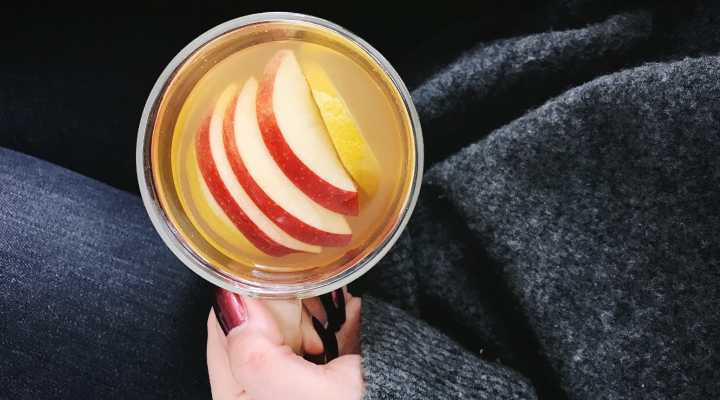 But as we found ourselves craving this seasonal favorite, we decided to discover how to make hot apple cider healthier. There are health benefits of drinking apple cider. This unfermented juice contains plenty of vitamin C and is rich in antioxidants. But with a low pH level, apple cider has high levels of acidity, making it dangerous to enamel. Plus, pre-made brands can contain nearly 30 grams of sugar per serving. So break out the cinnamon sticks, and learn how to make hot apple cider that won’t spoil your smile. Over medium heat, combine the apple cider, apple juice, sweetener and honey in a medium saucepan. Place the cloves, allspice berries, orange peel, lemon peel and cinnamon sticks in the center of a cheesecloth or layered paper towels. Fold up the sides and then secure with a string. Drop the bundle into the cider saucepan. Bring to a simmer and cover. Reduce heat to low and cook for 45 minutes to an hour, stirring occasionally. Remove the cider from the heat and pour into mugs, garnishing each glass with cinnamon and nutmeg. Serve with a straw to minimize contact with teeth. For more seasonal sips, check out our tooth-friendly pumpkin spice latte recipe.